Welcome to Battle Jump's home page. You'll find here Battle Jump's latest releases, and more. Battle Jump is a free 3D Platform game using OpenGL in order to be available on Windows, Mac OS and Linux. Do not hesitate to share with us your comments, and join our facebook page. After a few months without news, I'm proud to present you Battle Jump 0.12.0. This version is important because it will be available for Windows, Linux, and very soon for MacOS X! Your best time is now saved locally in "Single Map"
A ghost of your best play is saved in "Single Map"! You can also see the apparition of "+1" buttons in the main page and in every level, feel free to use them and to join Battle Jump's facebook group if you like the game! Have fun, and as usual feel free to contact me if you see a bug, or if you have questions. After a month of testing Battle Jump v 0.10.x on Windows many little problem were solved. As a result, the latest version of Battle Jump (0.10.3) is now available on Windows and Linux. Don’t hesitate to contact me if you see any problem with the game. Like everyone, I wish you an happy new year 2010. I would like to thank all those who have already tried the game, and I hope that you enjoyed it. Battle Jump will continue to evolve. New blocks and levels are planned for future releases, so keep an eye open. Hi. It's been a long time since the last version and there is a lot to tell about the new features. First of all this new version is available on Mac OS X! There is however a little restriction because you'll need to have at least Leopard to run it. The Battle Jump cover is now available in the Docs Folder. Many images are now in PNG format. You can now see the preview of all levels directly into the game. The two-player game has been modified in order to run several levels without returning to the menu. A counter of victories has been added in the two-player mode. You can download this new version right now. 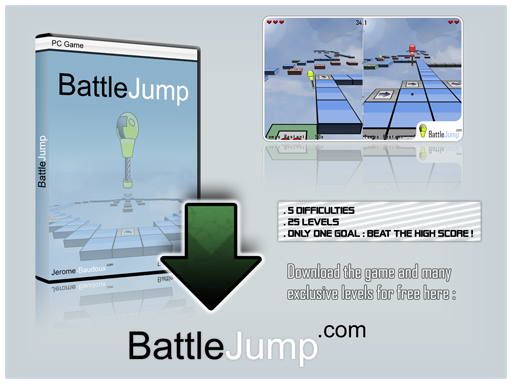 Thanks to the community, Battle Jump has more than 100 levels. 75% of those levels were created by members, so I really should be grateful to them. It is now possible to download multiple levels at once, all you have to do is to select levels to download and click "Download Selection". I would like to remind you that you can rate and comment all levels. You can also comment the news since today. To send your scores you must have the latest version of Battle Jump (0.8.1). All previous versions cannot send scores due to an incompatibility.